While reports today suggested that Apple's new Smart Battery Cases for the iPhone XS and iPhone XS Max have lower battery capacities than previous versions for iPhone 6 and iPhone 7 models, it turns out the new cases actually have larger capacities than the old ones when taking voltage into consideration. The new iPhone XS and iPhone XS Max cases are rated at 1,369 mAh, lower than the iPhone 6/6s case at 1,877 mAh and iPhone 7 case at 2,365 mAh, but according to Rene Ritchie, there are actually two such cells in the case. As a result, the new cases run at a higher voltage that yields a total of 10.1 Wh of energy compared to 7.13 Wh for the iPhone 6/6s case and 8.98 Wh for the iPhone 7 case. Some more context: while the mAh rating is lower, the Wh rating (10.1 Wh) is higher because it’s operating at a higher voltage. 7.13 on 6, 8.98 on 7 (they didn’t list V). Paired with Smart Battery Cases, Apple says the iPhone XS gets up to 33 hours of talk time, up to 21 hours of internet use, and up to 25 hours of video playback, while the iPhone XS Max gets up to 37 hours of talk time, up to 20 hours of internet use, and up to 25 hours of video playback. Of course, real-world testing will prove more valuable than tech specs, so we'll see how the new cases truly stack up in the coming days. 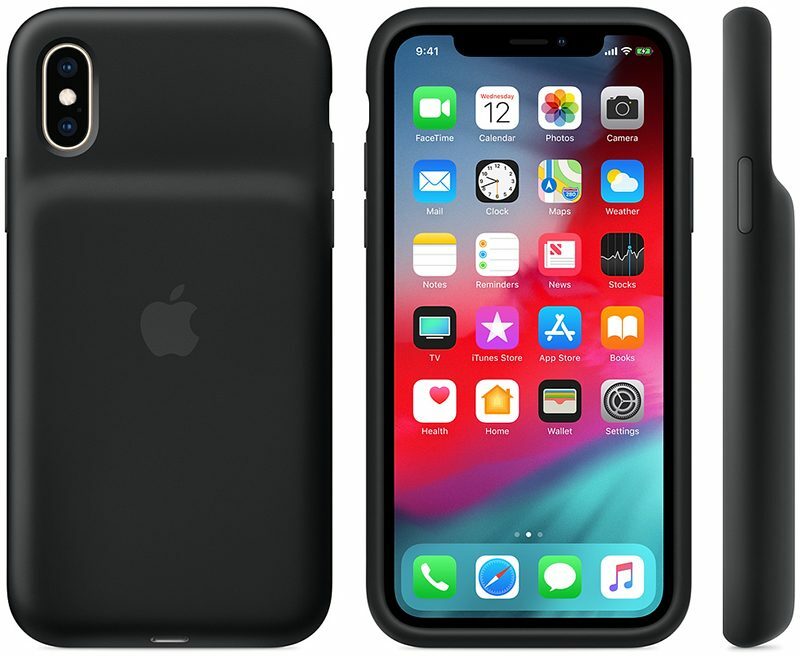 Apple introduced Smart Battery Cases for the iPhone XS, iPhone XS Max, and iPhone XR yesterday. All three are priced at $129 in the United States, with deliveries and in-store availability slated to begin this week. Apple says the cases are not compatible with the iPhone X, but results have varied so far. Another example why you should use Wh instead of mAh when you compare batteries. When you don't know the voltage, the electric charge means nothing. Was that a claim or requirement? No, just a desperate attempt to find a new reason to discredit the XS/XR smart battery case. See what happens when you jump the gun to get clicks? Sad the article writers here lack basic technical knowledge. The 13" MacBook Pro has a 5,086 mAh battery. The iPhone Xs has 2,6858 mAh. Did anyone think they were actually comparable without looking at Whr? Yes, literally almost everyone posting in the other thread thought that, including the writers. The one who looks worst in this is Nick Guy, the Wirecutter writer who first tweeted without context. Everyone else (except the iMore guy) only compounded the situation by taking it at face value. The Wirecutter is the site that includes a "Why you should trust us" section in each of their stories. Is it normal for the case to arrive with 0% charge? Also, I think it will take time to get used to the bump for me when typing. Other than that, though, it fits and feels good! And the bump isn’t *that* big. Much better, MR. These are the facts. So is Apple's better than the one Mophie is releasing soon or what? Yes, I would think so. As I wrote in the original thread, because it's made by Apple, the iPhone is able to know when it's plugged into an Apple battery case and use the case's battery first before switching to its own internal battery (at least if it’s anything like Apple’s last Smart Battery Case), which means less wear and tear on the iPhone’s battery. This also means that this is the only case that doesn't cause the iPhone to act like it's plugged into the wall when it's in the case and start doing battery draining stuff like iCloud backups and syncing photos to the cloud and such. I'm glad I missed the comments on the article before it got corrected. It must of been horror scape of outrage.